More than half of all cyclists suffer from back pain, making it one of the most common complaints among cyclists. The spine carries the weight of the head, neck, torso and upper extremities, and provides the body with both stability and mobility. 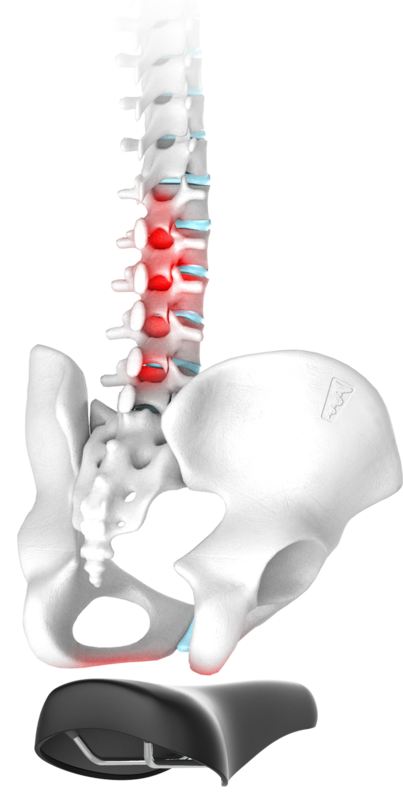 It consists of 24 vertebral bodies (vertebrae), which are connected by the pressure-absorbing spinal discs (disci intervertebrales). This complex structure is connected by different ligaments and supported by autochthonous and secondary musculature. Due to the complex structure of the back, the causes of back pain may vary accordingly. 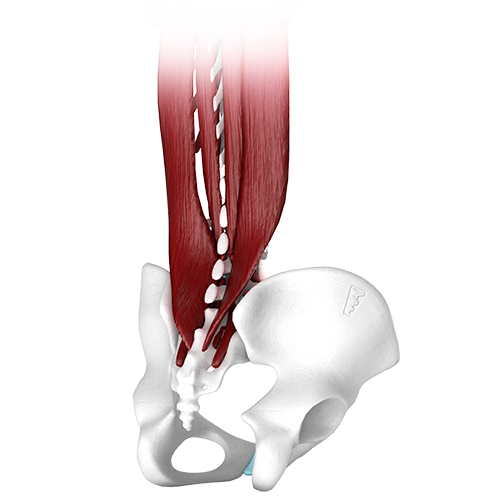 Why is the correct co-movement of the pelvis necessary? The system of contralateral interconnection is only used in the biomechanically correct gear. Evolution has given us an ingenious system which, provided it is not damaged, allows us to move with ease. When cycling, it is also essential to involve the pelvis in the movement (pelvic sway). This horizontal movement is achieved by our SQlab active saddle technology which is integrated in every active bicycle saddle. If the pelvis position is fixed in the sagittal axis on the bicycle, you may experience discomfort in the lower lumbar spine, the pelvis and hip area, as our musculoskeletal system is not designed for holding this position. The intervertebral discs consist of the outer fibrous ring (Anulus fibrosus) and the inner gelatinous nucleus (Nucleus pulposus). 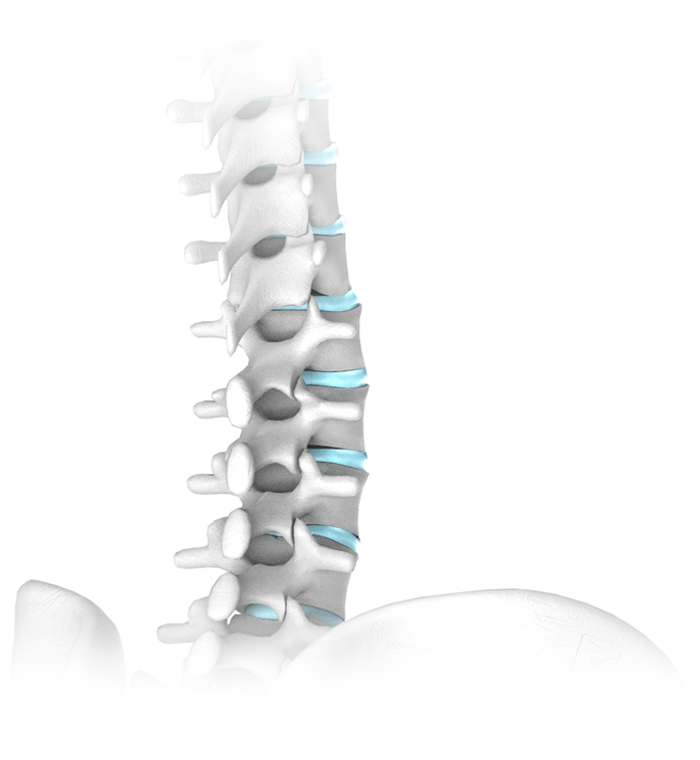 In daily life, the spine is exposed to constant movements and impacts. The spinal discs (disci intervertebrales) act like a kind of water cushion due to their structure and buffer shocks ideally. 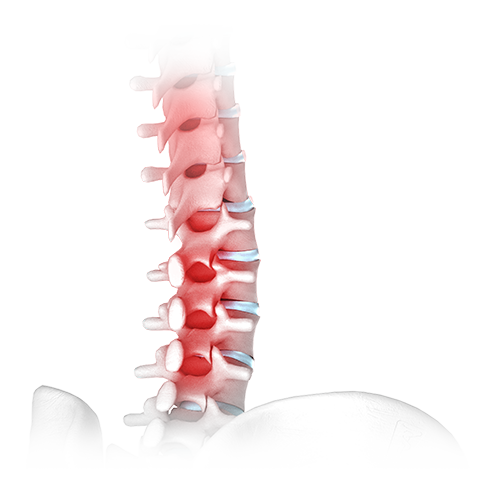 The intervertebral disc tissue is one of the tissues that do not regenerate well. The nutrition of the spinal discs takes place almost exclusively by diffusion. Imagine a sponge - there is a constant inflow and outflow. The outflow takes place mainly during the day under the pressure load. This results in the body height decreasing up to 2.5 cm (approx. 1 mm per spinal disc) towards the evening. At night the spinal discs get rehydrated so that they are fully operational again the next day. Excessive strain can lead to a displacement of the spinal discs, which is commonly referred to as herniated disc. When cycling, incorrect bicycle set up can have a strong effect on freedom from symptoms or pain, respectively. At the same time you should be aware that bike fitting is by no means something that only professionals profit from. Various studies have shown that correct wheel positioning protects against excessive strain and the resulting injuries. Therefore, everyone who rides a bicycle regularly benefits from a correct wheel positioning. Even details such as a wrong saddle tilt have a negative effect on the lumbar region. Even details such as a wrong saddle tilt have a negative effect on the lower (lumbar) area. If the saddle tilt is set incorrectly, the pelvis, too, will tilt unnaturally, which can result in increased tension or even strong strain on the lumbar area. A reach that is too short (distance from the middle of the bottom bracket bearing to the middle of the steering axle on the stem) is another common problem that manifests itself in back and neck pain. A sitting position that is too compact results in an increased curvature (flexion), especially in the lumbar area of the spine, which results in these problems. Experienced bike fitters can adjust all these parameters in order to achieve a result that is optimal for you. Source: Marsden, Mandy & Schwellnus, Martin. (2010). Lower back pain in cyclists: A review of epidemiology, pathomechanics and risk factors. International Sportmed Journal. 11. 216-225. An often underestimated cause of back pain can be back muscles that are too weak and tense due to muscular imbalances and shortening. The back and shoulder girdle should be strengthened and mobilized regularly. Since most people work from a seated position, shortened muscles in the chest and weaknesses in the back of the shoulder and neck are among the most common problems. Through targeted stretching and strengthening exercises, acute complaints can be counteracted and future ones avoided. Our patented SQlab active saddle technology mobilizes and strengthens the lower back. The construction of the active system allows the pelvis to move on a horizontal level. The execution of the so-called pelvic sway is thereby guaranteed - just as with natural walking. The possibility of involving the pelvis in movement therefore minimizes the risk of developing complaints in the lower lumbar spine, the pelvis and the hip, and results in systematic relief of the spinal discs and facet joints. Together with Dr. med. Markus Knöringer, specialist for neurosurgery, spinal disc and spinal surgery, we have developed the SQlab Back Handbook to specifically help strengthening the back muscles.